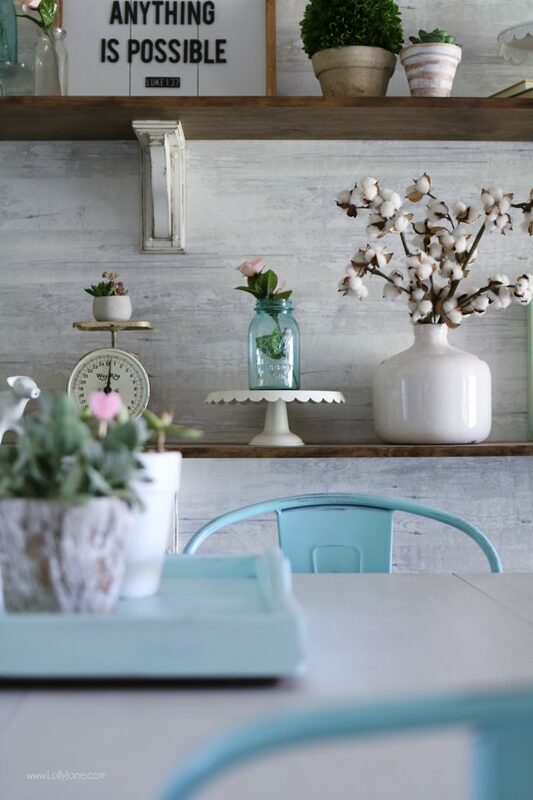 Here are our official how-to’s on styling your farmhouse shelves now that they’re up! Wrangle up old books and display them page-side up. Display stacked or upright, against a vintage looking cookie jar or with a succulent on top. Cake stands are our very favorite way to stage. Stands of all sizes work and you can stack them to add height. 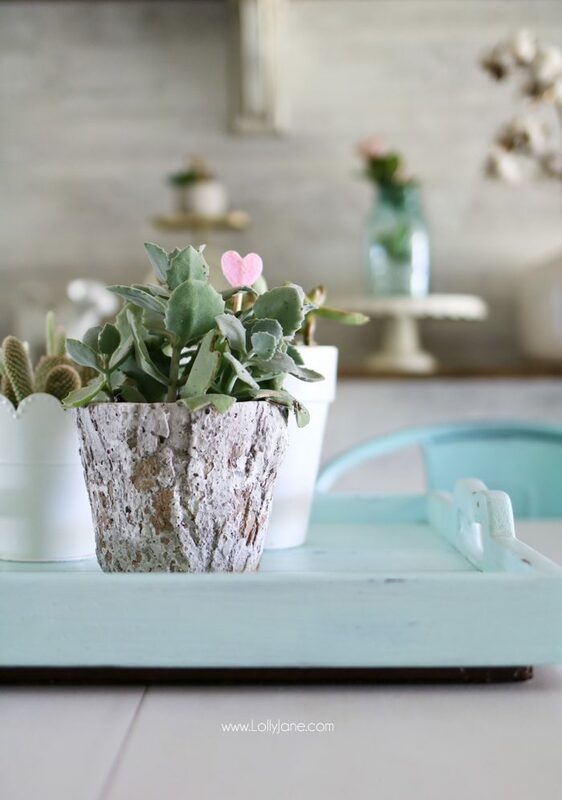 Succulents add pops of greenery without spending a fortune! You can even find faux ones at the dollar store today so they’re very affordable but make a big statement. We like to put them on books, on cake stands, as is or inside planters. Fake flowers (roses) allow a touch of color against the green. Unused picture frames, with or without art inside, is a great way to add height at texture. Larger items like vintage scales are great to fill the space but also house smaller pieces of decor such as said succulents. Water pitchers are great to use a vases and can be filled with faux flowers to take up space as well. We are sign makers so having a few signs is great to personalize the space and show some personality. Don’t forget your tabletop! A thrifted tray houses more succulents and distressed planters, makes for a super easy and affordable centerpiece but also allows the flow of the shelf decor to spill over to other parts of the space. Today, almost anything goes so grab cake stands, bowls, plates and whatever else you can find to stick on those farmhouse shelves of yours! Of course you do! ENTER BELOW VIA RAFFLECOPTER to win ANY area rug from the Laguna Collection. Good luck and a big thanks to our friends at Mohawk Home! PLEASE PIN so your friend’s can score new decor ideas too! love the rug and the shelves! 80108 email address in comment details. thanks! HEY GIRLS- love the finds! so cool! What a lovely space, your posts always leave me inspired ! 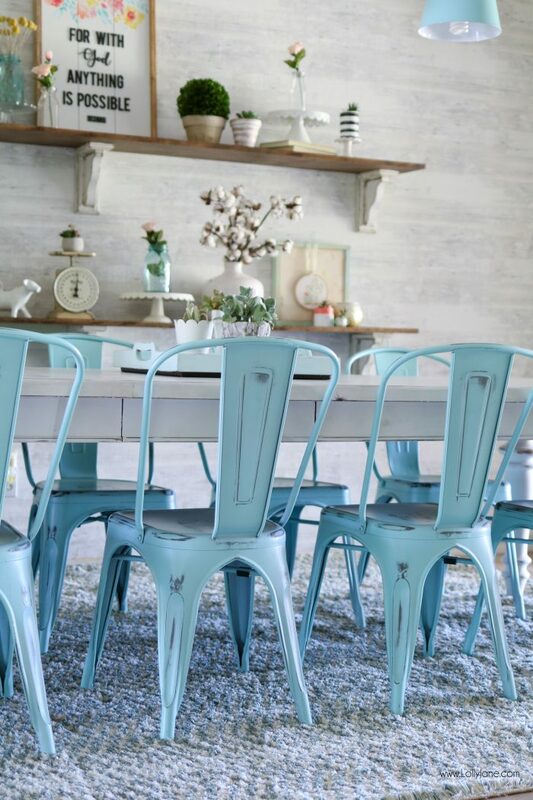 Love the soft touches of blue combined with the neautral color scheme. Great rug! I’m in love with the blue and the touch of green in the plants. Such a fun pop! I love Mohawk rugs! They’re tough enough to withstand kids & beautiful! This is an awesome giveaway! Love it! 85335. Thought I should tell you that my twin and I are also from Arizona and named Kelli and Kristi. ???? Fun coincidence. Love the rug…winning one would be great in our low budget renovations we are doing. The rug really pulls the whole room together. I’d love to win one! Lolly Jane, your blog is just the very best! And a new, fabulous, rug is just what my home needs before our big family get together for my daughter’s baptism!! My daughter is getting baptized this weekend, so fun 🙂 Congrats to your girl! We’ll cross our fingers for you guys! It looks so awesome! Love that dining area! So many great choices in these rugs! Julie, 93021, simijules at sbcglobal dot net. Your room looks awesome! I love the Clinton rug in beige, would look so good in my living room. I’m trying to transition to a farm house style and really need some neutrals! Robyn Gist, 42303, robyn.gist@yahoo.com. Thanks for the great give-a-way! Love it! You gals are so creative. Thanks for sharing all your brilliant ideas and finds!! You always give great advice. Love your style! And that rug looks fabulous!! carol clark 75633 ccntx@livedotcom . Love that they use recycled materials! These rugs are gorgeous!!! So cool!! I love when people are so creative and environmentally conscious and can recycle things into something useful and pretty!! Thanks for the chance! Would love to win! Love it all!! The shelves look awesome and the carpet?! Love it! Love this whole farm house look! Slowly getting out home together hoping it Dan bad half as precious as this! I have such a hard time deciding how to decorate my open shelves in the kitchen. This post definitely helps, thank you! Love how you bring the farmhouse style into the desert! I sent my husband a strong hint about the shelves (thanks!) because they’re perfect for a hall we’re remodeling. The rug is so lovely. I love the Earth Die tie in and will definitely keep that in my regarding Mohawk’s sustainability initiative. Well, I do need a rug! Need a rug to work in my living room! I love the shelves, the chairs, the rug… all of it! Thanks for the chance to win! Oh my, I love everything about this. Must have the bark plant holder. About to purchase my first home, so I’m crossing my fingers to win one of these gorgeous rugs… they all fit so perfectly with my boho theme!! Your site is like a breath of fresh air. It makes me feel like I do when I open the windows after a long endless winter. Love the total look…thanks for the sweet giveaway! Oh I love this giveaway! I love the colors! Thanks! 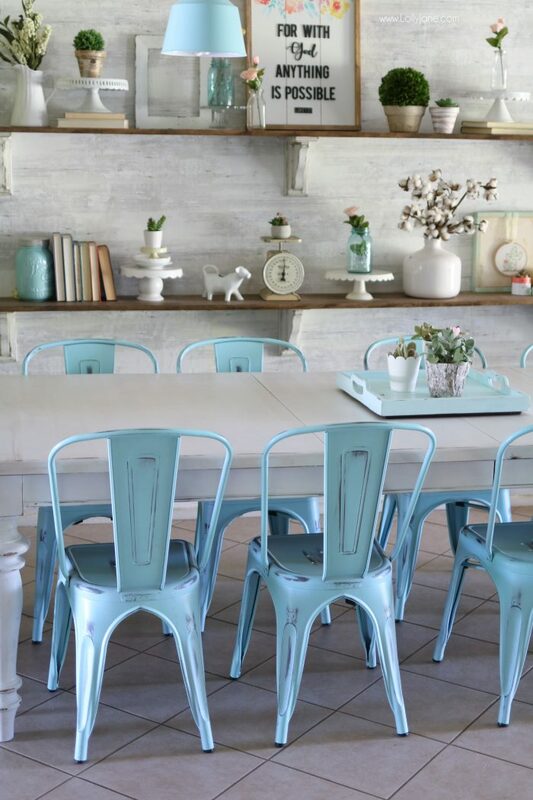 Love those chairs!! And i neeeeed a new rug!!! Your rug is beautiful. I just watched the video on how Mohawk recycles plastic to make the rugs, awesome! Amazing what technology can do! Love the rug! We are building a house and using Mohawk carpets and hardwood! Oh how awesome! Great quality! 88005 I am in desperate need of a rug for my dining room. Keeping my fingers crossed. Love the blue rug and your tips for shelf styling. I can’t bring myself to use fake flowers, but the rest of the tips are great for me! Thanks! And thanks for the chance to win a rug! LOL…nightmares from the 90’s, lol!! 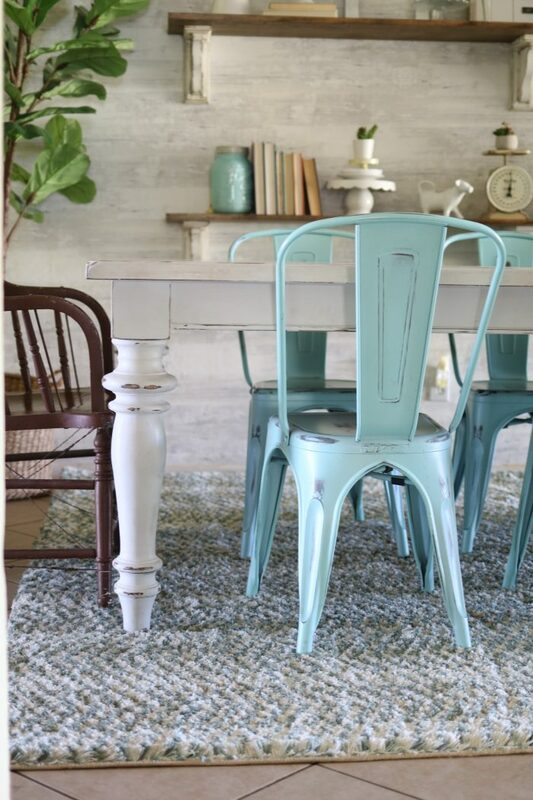 I absolutely love the aqua chairs with that rug! I’ve been teaching my students about Earth Day! I love that the rugs are made from recycled materials. Always love a little shelfie inspiration! Pinning this one. We are building a new house right now which will have a wall with open shelves. Perfect timing with this post! Love the colors in your rug. Love Mohawk products! And your farmhouse styling is perfect to incorporate old and new! Hey, girls! Love this farmhouse look! Excitedthat I have lots of the “farmhouse” pieces to use on shelves! Also ~ I have two daughters named Kristi and KellY … great names, yes?! Yes, for sure great names Kathleen! 😉 Cute! Would love to win! Thanks for the chance! My zip code is 92544. You have the rest below. Such beautiful ideas. I am a contester and would have never found your blog without Mowhawk flooring. I love the cute crafts! Love this! Sheri Anderson 85225 bakingmom@gmail.com Thanks!! I want a nice rug???? What a cool process and beautiful rugs!! I need a rug for my living room and yours is so nice! I love following you girls, and I love, love, love your signs and crafts. ???????? That is so cool that the rugs are recycled plastic bottles. Rebecca, 75056, busymomintc@yahoo.com. I love the chairs and table. This is such a cute room! Brandy email btrover77@gmail.com zip 78729 Thanks for the chance! Love the dining room! The rug really ties it all together. You guys have the best style!! The rugs are absolutely beautiful! Lmclaughlin91@yahoo.com 36117! So excited! Beautiful rug! Love your new rug and the shelving is ????????!! Oops I forgot my info???? I love the signs you put out. Where do you find your inspiration? I love all the blue accents! Lovely! Thank you so much for sharing at Celebrate Your Story!! 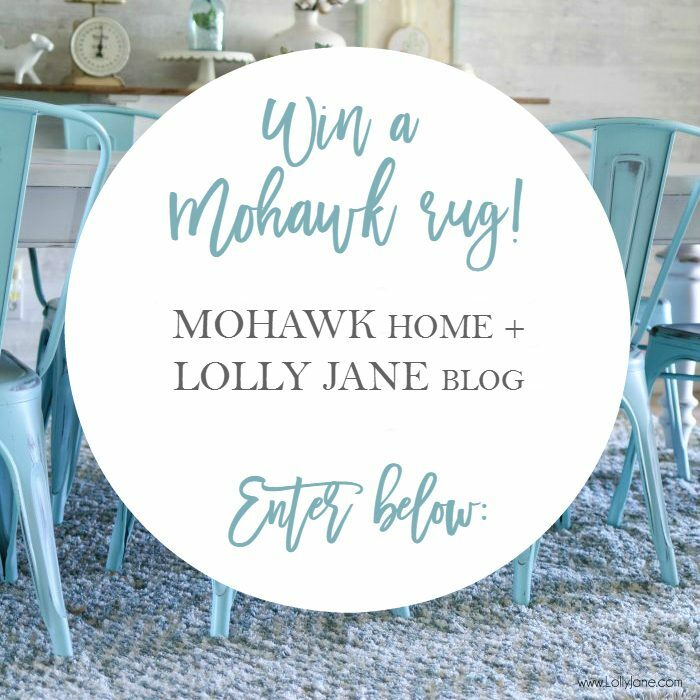 Well gosh, I would loved to of entered, I love Mohawk such a great company and pretty rugs. Love the colors–thanks for sharing @Vintage Charm! So many great ideas here! We need to build floating shelves, and I am an admitted fan of farmhouse decor, probably long before it was cool to be a fan. I still want a farmhouse, but one that is firmly planted in the middle of the city of Chicago. Hi! I’m one of the co-hosts from the Welcome Home Wednesdays Link Up. 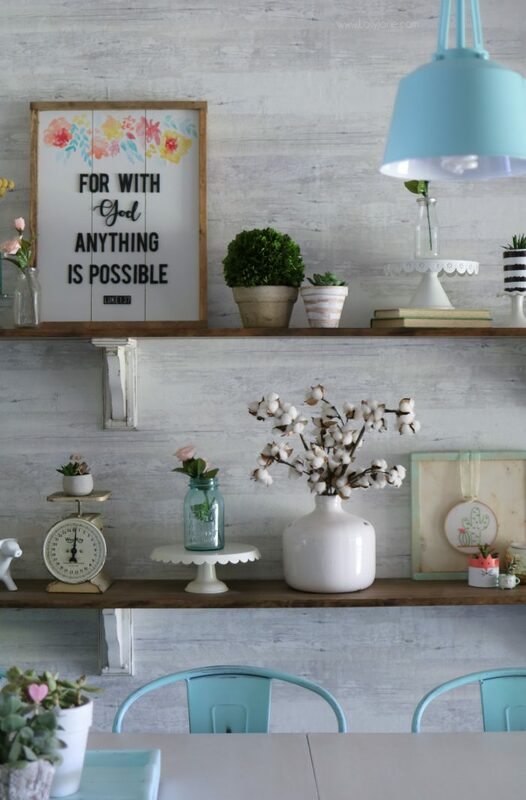 I am so obsessed with how you styled your shelves! 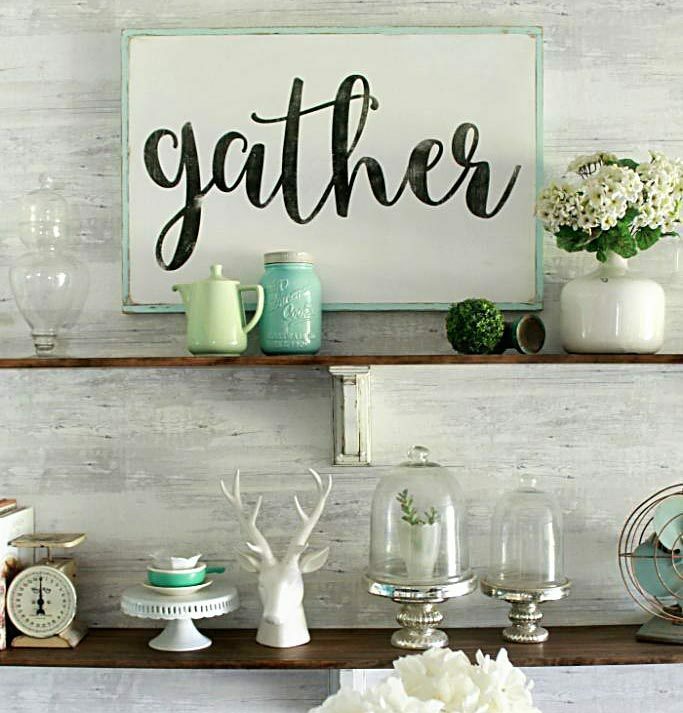 I love all things farmhouse and vintage anyway so this definitely sparked my interest. I also love those chairs! Wha ta pretty, cozy room! Thanks, Leslie! Thanks so much!